CamoMats bring the unique camo look to high quality custom fit automotive carpet floor mats with two outstanding new Mossy Oak® and four Lloyd branded camo designs. These mats feature a long-wearing carpet face of premium nylon yarn and our multi-layer backing of woven polypropylene mesh, heavy latex and final TractionBac™ for moisture protection, shape retention and skid resistance. Whether you like Camo for the fashion or the function, CamoMats will protect and enhance whatever you drive. CamoMats provide unmatched quality, fit and style. The Camo designs are permanently dyed into a long-wearing carpet face of premium nylon yarn. The multi-layer backing of woven polypropylene mesh, heavy latex and final TractionBac™ provides moisture protection, shape retention and skid resistance. Factory compatible mat safety anchors or Lloyd’s easy to install hooks, are also standard with all of Lloyd’s mats. Featuring mat fastening systems. 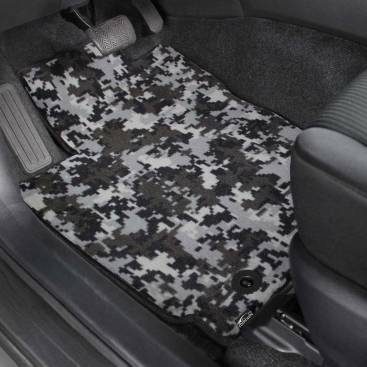 When your brand vehicle provides mat retention hardware in the vehicle, mats are designed to attach to that hardware. In all other vehicles, we provide easy to install proprietary mat fasteners.